Perfect for pool, patio, inside and outside, our everywhere glasses have such clarity, you might mistake them for crystal. Indoor/Outdoor Colored Glassware Perfect for pool, patio, inside and outside, our everywhere glasses have such clarity, you might mistake them for crystal. But they're not. They're actually made from food-safe, shatter-resistant Eastman Tritan Copolyester (BPA-free/FDA-approved) that won't crack or break, making them ideal for entertaining anywhere without a worry. Dishwasher safe (but note, they must be put on the top rack only and are not suitable for a heated cycle). Set of 4. Honestly I have no idea. I would say to ask Wine Enthusiast. They may know or be able to find out. Overall i have been happy with these. I also have the clear and we use them a lot when entertaining and also when outdoors. I use them pretty regularly for Irish coffee. Sorry, I don't know if the glasses can be personalized. The glasses are beautiful but the lip edge is kind of sharp. Hello what is the difference in quality. Between 766 11 12 and 766 11 04? BEST ANSWER: The Indoor/Outdoor Mixed Color Wine Glasses (Set of 4) are the same glasses as the indoor/Outdoor Mixed Color Wine Glass Party Pack (Set of 12). They are both made from food-safe, shatter-resistant Eastman Tritan Copolyester (BPA-free/FDA-approved) that won't crack or break. very nice to drink from and pretty colors. Nice for outside on the deck. Wash up well and they do not have that "plastic" taste. Glad I purchased them and may order another set. I hesitated about ordering these wine glasses, but am so glad I finally did! 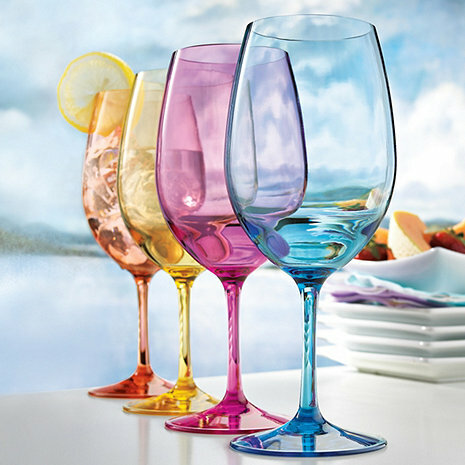 They are great to serve wine in while outside & even great indoors for those who are clumsy! Bought these for some fun sipping on the beach this summer. Love them! these are soft plastic, like a rubber almost I like it much better than the typical hard plastic outdoor glasses. Hand washing they clean up great no residue. These glasses solved the problem of serving wine at poolside without using glass. Love them! When I bought these glasses, I got them to go with the dinnerware set I just bought and the glassware as well,(rock glasses and highball). They all have nice bright colors as do these glasses so I thought they'd be perfect. I do like them, however, I wish they were glass as even the ones I mentioned above are glass and I was able to buy both sets of 4 each for less than these. I'll keep them, but for casual use and keep looking for assorted colored wine glasses that are glass. The edges around the rim bother my tongue. Looks good in theory, but wish I would have bought something more expensive, but nice to use. I purchased these for peace of mind while poolside. I prefer to drink wine from glass. However, these are great by the pool. Very durable and I don't have to worry if one gets tipped over. I love the bright colors too! They are awesome. Tile floors and crystal stemware just do not go together well. These wine goblets are pretty enough for inside as well as outside, and definitely will not explode when dropped. I am very happy with my indoor outdoor plastic wine glasses. They look so nice and are perfect for outdoor parties. I love the four different colors. Makes them easier to identify. They are easy to wash. These are perfect out on the deck etc. If someone knocks one over, no problem...they bounce! Well made and feel like glass in your hand, just a little lighter. Beautiful colors, unbreakable!! Dishwasher safe. Love these glasses, bought six sets of four for friends. These were purchased for outside use, no more broken glass. They were as advertised. Very light weight. Not bulky like most non-glass products. The colors are a great way to be able to identify your glass in a group. Great reviews from our neighbors too. Would not hesitate to order these if you need something other than glass wine glasses. top heavy when holding wine; they are MUCH taller than I expected. Pretty colors, though. I since have purchased the jewel-toned GLASS wineglasses. They are better but there are tiny chips in the rims of at least two of those. Quality control has not been so good. I had wanted to use them when Guests were present, but they are so lightweight,thin, and tall, that my wife and I will use themselves. Feel like very cheap plastic, instead of heavy acylic as we had thought they would be. Sipping Edges are not smooth to the lips.